With graphite, you can get started with a single #2 pencil if that’s all you have, but these are my favorites to work with. 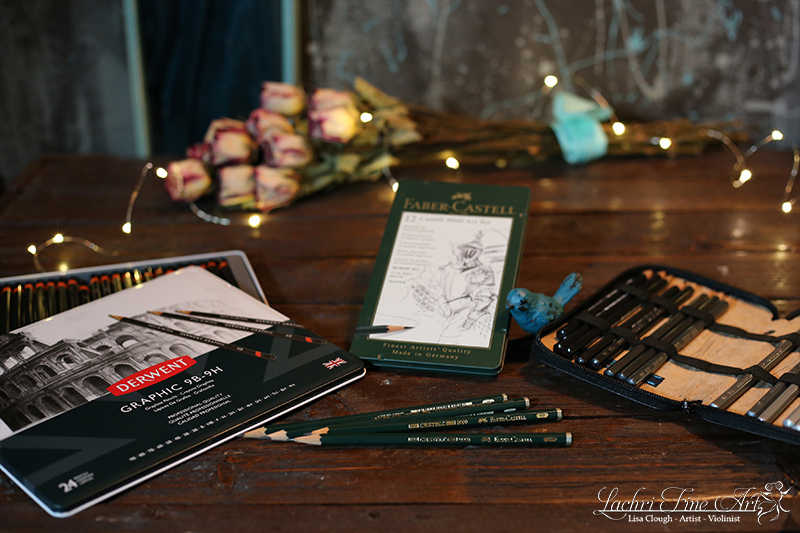 Derwent Graphics – these new/improved pencils are wonderful! Generals Graphite Powder – Not a pencil but SO nice for smooth backgrounds! See how I use this product in this video! Faber Castell Graphite Aquarelle – Water Soluble Graphite, watch my review on these pencils in this video! Graphitint – These are water-soluble tinted graphite pencils. Watch my review in this video! Fabriano Artistico extra white Hot Pressed 140lb watercolor (I get this from dickblick.com, this one is always WAY overpriced on amazon). Glassine This is what I keep under my hand to prevent smudging my work with my hand. Derwent pencil extender This is so that you can keep using your pencils even when they’re used down to the last inch! drawing board I don’t use the clip, but use low tack masking tape instead to tape my work to my board. Kum handheld sharpener I’m in no way saying this is the best sharpener, but it’s cheap and has worked well for me. I have gotten a few lemons over the years though. Kum long point sharpener This sharpener is a two-parter. You first sharpen the pencil to a long point, but the end will have a lump. Then you use the other side which brings it to a very fine point. This one seems to work great with some pencils but can be temperamental. I didn’t love it when I first got it, but now I find myself using it all the time. The links on this page are my Amazon affiliate links.